The Play to Kodi web-browser allows you to trigger videos from your browser to play on your Kodi. This is helpful for when you want to play videos from a service that doesn’t have a functioning Kodi addon, such as Hulu or the Australian/New Zealand anime site Animelab. 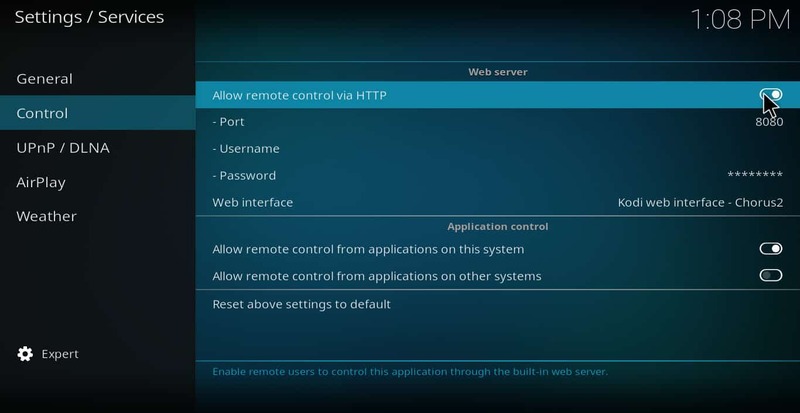 In some cases, Kodi addons may also lack the features available in the web interface for the service, even if the videos do play. In these cases, you may prefer to use the web-browser to trigger videos instead of using a Kodi addon to do it. Regardless of how you use the Play to Kodi browser, it can definitely give you more flexibility to play the content you want when you want. Kodi is free, downloadable software from the Kodi foundation. It can be installed on Amazon Fire Stick, Apple TV, PC or Mac. It can be streamed to a Roku by mirroring your iOS or Android phone’s screen to it. To control it, all that is required is a smartphone or RF remote. Kodi is often associated in the media with video piracy. However, while it can be used for this purpose, there are plenty of legitimate uses for it as well. The Play to Kodi browser addon that this article discusses only streams from sources that are properly licensed and respect copyright law. Like Kodi itself, VPNs are often portrayed as being useful for viewing pirated movies and shows without being caught by your ISP. However, people who only stream from legitimate sources should also use a VPN. Streaming video without a virtual private network can expose you to attacks by malicious programmers. It can lead to your speed being slowed by your ISP, causing Kodi to buffer. Content-providers may also block you from viewing certain content based on your geographic location if you don’t use a VPN. Unfortunately, even getting a VPN may not completely solve these problems. Many VPNs keep logs of users’ behaviour that can potentially be stolen by hackers or accessed by law government officials. Some VPNs only have servers in a few countries, limiting their usefulness in unlocking geographic content. There are also many VPNs that are too slow for HD video streaming. Because of these problems, we recommend Kodi users employ IPVanish. IPVanish has over 850 servers in 60 different countries. This keeps speeds high and maximizes the content available to you. It also keeps no logs, further protecting you against attackers. It’s easy to install and has a native app for both the Amazon Fire Stick and Nvidia Shield. It’s an excellent VPN to use for streaming video. READER DEAL: Save up t o 60% on an IPVanish plan here. Play to Kodi can be installed on either Chrome or Firefox. 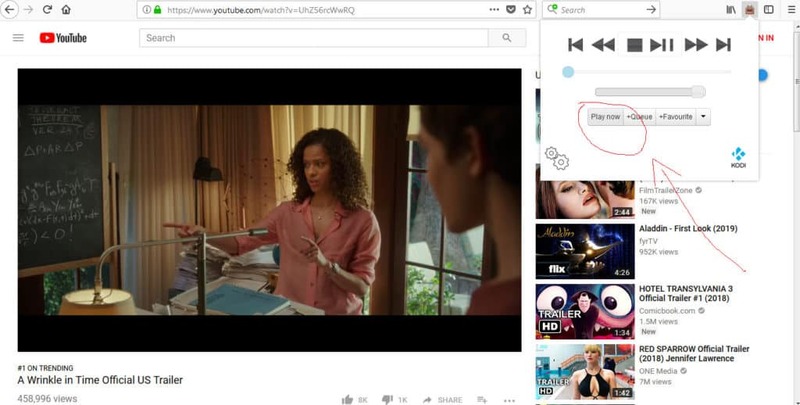 If you’re using the new Firefox Quantum browser, all extensions still work, including the Play to Kodi extension. If you’re using Chrome with a VPN, make sure you use the browser logged out and log out of all Google accounts as well. Otherwise, Google will cache your IP address, making your VPN useless. We have not tested Play to Kodi for use on Opera. 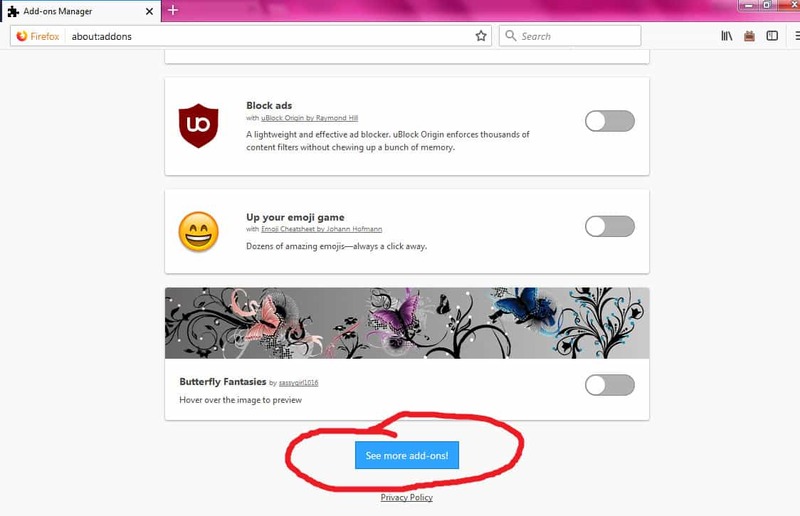 But since Opera claims that it can run Chrome extensions, it should also work on there. 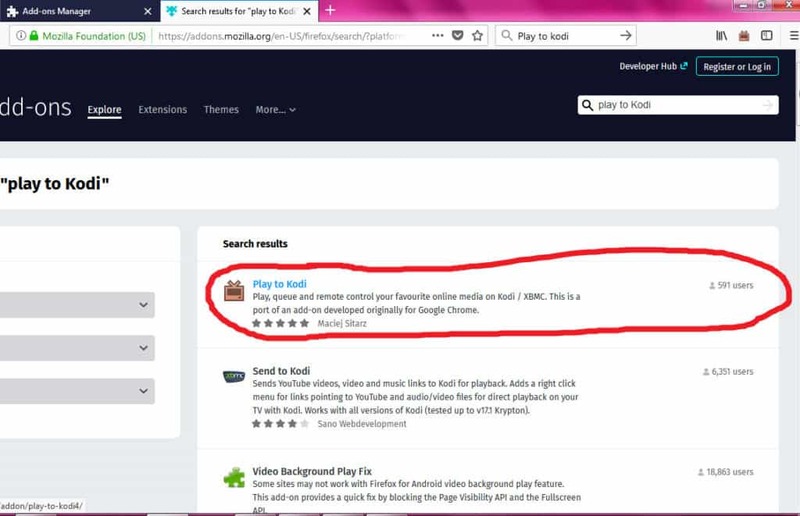 For this article, I’m going to focus on how to install Play to Kodi on Firefox, although the steps are pretty similar regardless of which browser you use. In the search bar at the upper-right corner of the page, type “Play to Kodi” and hit enter. That’s it. Play to Kodi is now installed. You will see the Play to Kodi button in the upper-right corner of your browser from now on. 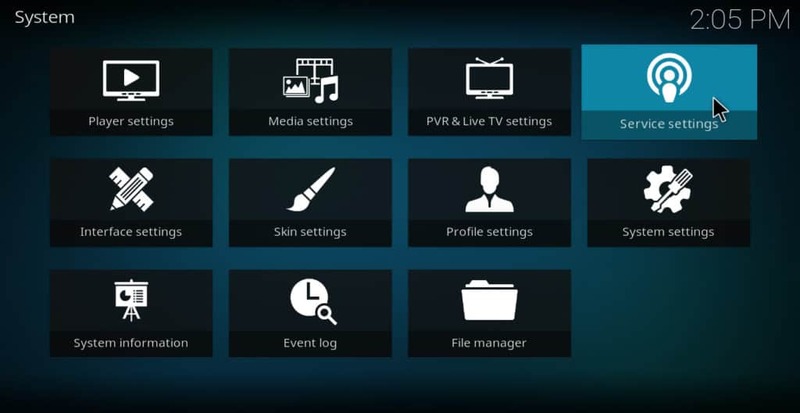 From the main menu of Kodi, click the gear icon in the upper-left corner of the screen. Hover your cursor over network. 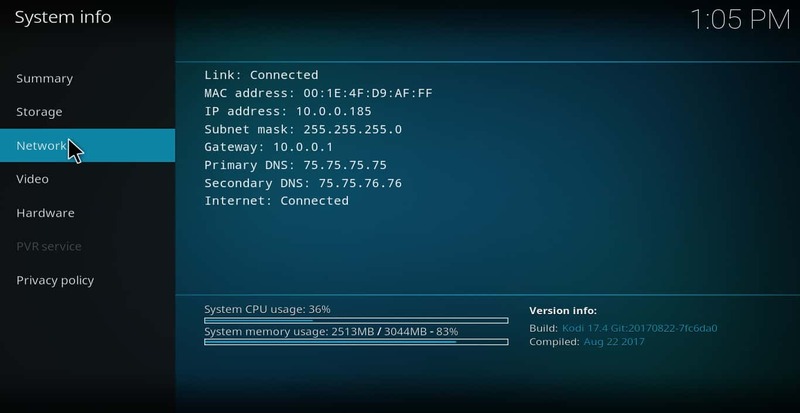 The internal IP address will display on the right side of the screen, along with several other bits of info. 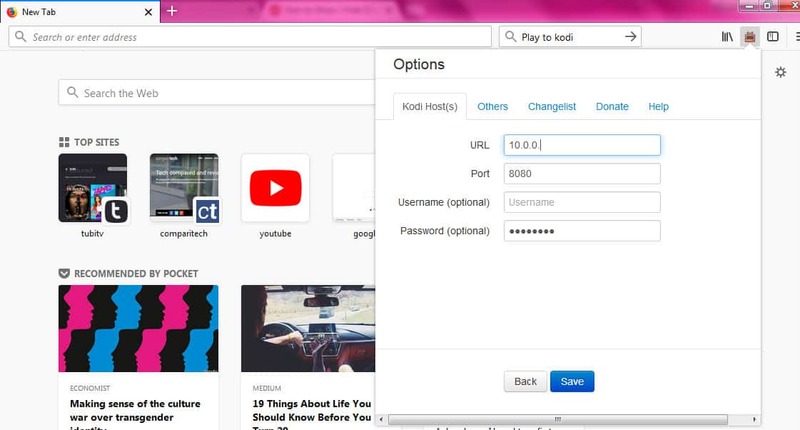 Once you’ve got the IP address for your device, here’s how to set up the browser addon. 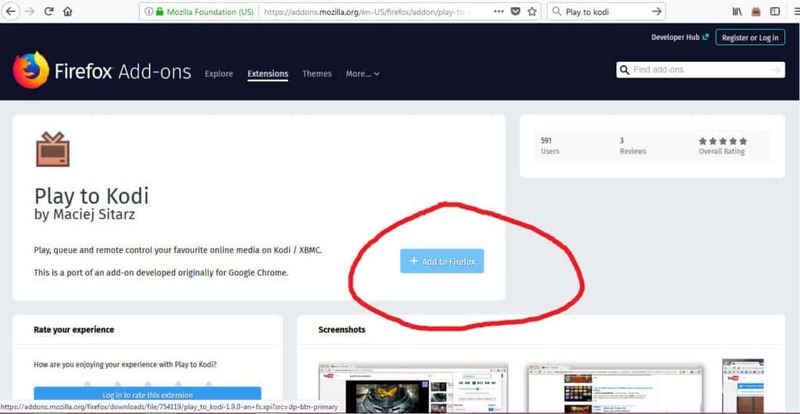 The setup menu also allows you to toggle a few options, such as whether to show a “repeat” button during videos or whether to enable multi-Kodi hosts. In addition, you can use this menu to donate bitcoin to the developer or read about the latest updates. In order to use Play to Kodi, simply navigate to one of these sites and start playing a video. When the video begins to play, click the Play to Kodi icon and select Play now. Within a few seconds, the video will begin playing on your Kodi. If you’re already playing a video on your Kodi and want to que one to play after this one finishes, just click +Queue instead of Play now. You can also add videos to your “favorites” list with the +Favorites button. Once you do this, the videos will show up in a list every time you open the Play to Kodi menu. You can then play them directly from this list. The Play to Kodi addon menu has standard media-player controls as well, like play, rewind, fast-forward, stop, etc. 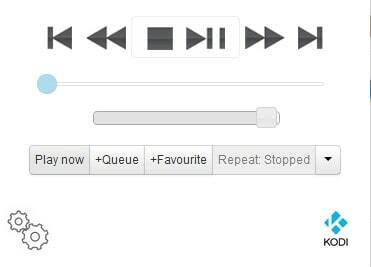 ; and it has a repeat button that can be toggled on and off. 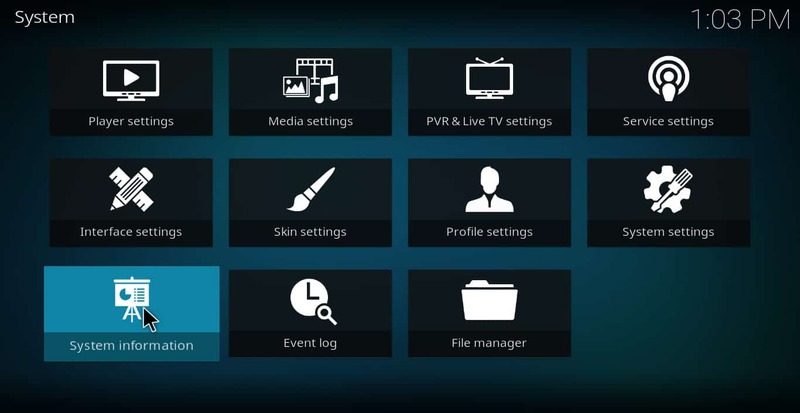 Despite all of these features, there may be one big disadvantage to using Play to Kodi: it may not allow you to control one device with another. In my own testing, I found that I could not stream videos from my PC to my Android device using it. If this same problem occurs with TV devices such as the Firestick and Nvidia Shield, it may force users to sideload web-browsers onto their devices in order to use it, which may be more trouble than it’s worth. However, this problem could also be unique to my particular Android phone. You may want to do your own tests before giving up on this feature. If you want to try a different browser addon that does the same thing, you can try Playit on XBMC. Like Play to Kodi, Playit on XBMC also works on Firefox and Chrome. However, it is not compatible with Firefox Quantum. It also has poor reviews when compared to Play to Kodi. But it may be worth trying out if there’s something about Play to Kodi that you don’t like. If you have a subscription to Hulu, Animelabs, or another streaming service that doesn’t have a functioning Kodi addon, you can often watch them on your Kodi anyway using Play to Kodi. In addition, Play to Kodi provides a more convenient interface in those cases where a particular addon lacks the features of the site’s web-interface. Overall, Play to Kodi is an excellent browser addon for Kodi users.